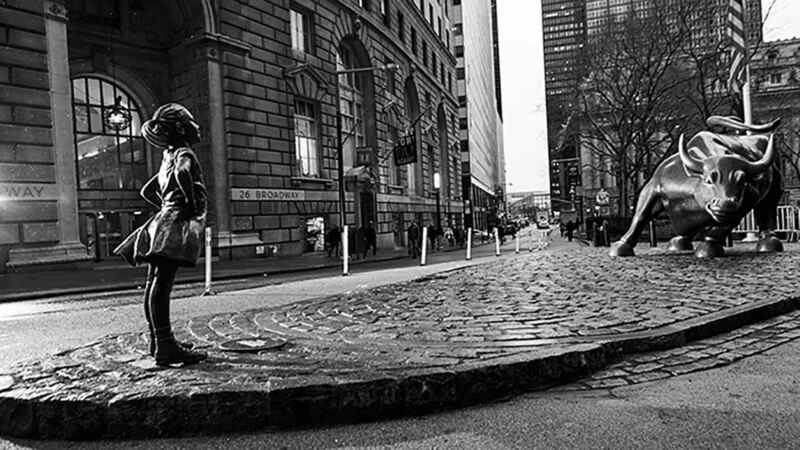 FINANCIAL DISTRICT, Manhattan -- In anticipation of Wednesday's International Women's Day, a bronze statue of a defiant girl was placed directly in front of the iconic Wall Street charging bull. The statue, installed by State Street Global Advisors, was meant to send a powerful message about gender diversity in the workplace. The statue depicts a girl in a dress and sneakers, standing firmly with her hands on her hips, looking up with a proud expression. It is part of a campaign the firm is kicking off to implore the 3,500 companies State Street works with to hire more female employees. A spokesman for the company said, "She stands as a reminder ... that having more women in leadership positions can lead to increased performance and a stronger economy."